Ever since I stopped biting my nails, (terrible hait, ahem!) I have been trying to get them as strong as possible. I feel I’m at a place now where I can safely recommend a few wonder products which have helped me to achieve this. This three part series covers these products which I highly recommend to anyone stuggling with brittle nail. One of my first plans of action for strong nails was switching to a crystal nail file, and let me tell you - my nails have been in an amazing condition ever since! 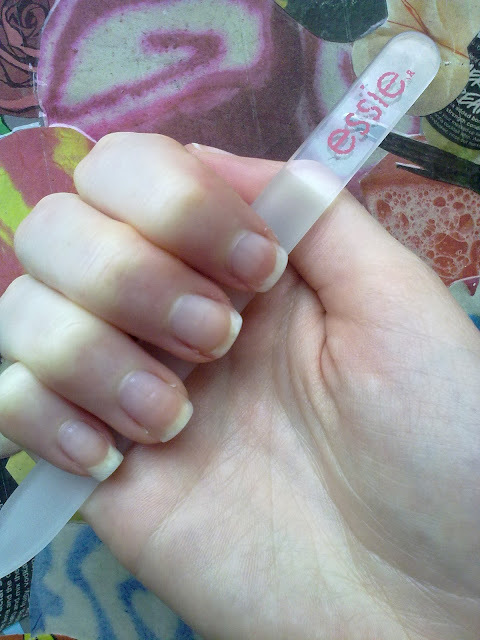 My nail file is by Essie, a brand that has recently blown up in the Blogosphere following the launch of their Diffusion line in the UK. The crystal nail file leaves my nails incredibly smooth following filing them, and it makes maintaining them at a healthy length incredibly easy! A few strokes is all you need to perfectly file your nails down to your desired length. Unlike emery boards, the crystal nail file doesn’t leave a scratchy edge on your nail post-filing. Another great thing about the crystal nail file is it should last a lifetime if you use it in the advised way! It can also be rinsed with water and comes up as good as new after! I bought mine from America, but I know that you can get them on Ebay (Click here) for £10.49. What do you do to keep your nails strong and healthy? I love crystal nail files!!! Your nails look lush! i'm going to have to get one now! your nails look really strong. i take b vitamins.. but other than that, i can never get my nails very long. Avene Cleanance Lotion Toner - Summer MUST HAVE!